Hell is just as real as Heaven. The MAIN central point I see in the gospel is that God, through Jesus Christ, is reconciling (reconnecting) us to Himself for the purpose of relationship NOW and giving us “eternal life”. The bible says that "eternal life" is in fact, intimately "knowing God" (John 17:3). Our reconnected relationship and union with God Himself, through our entire life, is the MAIN point of our salvation! The good news I preach is that "eternal life" starts NOW! When we repent and become born again this NEW eternal life in Christ begins that very second and never, never ends! Hallelujah!! Eternity begins with Jesus and never ends in Jesus! Now that is good news! Hell is a very real place just as Heaven is. This also I adimetily preach. When you die there are only two eternal positions, you are either found: “In Christ” or “Apart from Christ”. There are NO other other options. To die apart from Christ, there is a very real place of torment and separation from God, “Hell”. (I will not take time to explain Sheol, Hades, Gehenna, the Lake of Fire). To die in Christ there is everlasting union with God, joy, celebration, “Heaven”! I praise God that He has made a way for every person to gain eternal life, connection to God Himself right now, not just after we die but today, right now! So today, I implore you choose eternal life NOW, be reconciled to God in Christ alone! Repent and be saved!!! Hallelujah! This happened at the train station in Salzburg, Austria. I love how the simple yet profound gospel of Jesus Christ works everywhere (even in Mcdonald's) in power! My friend Philipp and I saw a young man in Mcdonald's and we felt to let him know that Jesus loves him. I was asking the Holy Spirit for a word of knowledge but nothing came. So we said hello and told him how much God loves him. He said he didn't know if he believed there was a God or not. I shared my personal Jesus salvation testimony in a couple minutes and then we shared the simple gospel of salvation through Christ alone. This young man's eyes were really hungry with everything that we shared about the gospel! We asked if he would also like to receive the forgiveness of his sins and start a new relationship with Jesus Christ as his Lord and Savior! There is saving power in our personal salvation testimony and the simple and profound gospel of Jesus Christ! We head to Moscow Russia in a couple weeks to see Jesus be glorified! We get to preach the gospel in a couple nightclubs! Please pray for our time there. See our monthly Partners Program! I believe we have all, at times experienced a sense of dullness or sluggishness of heart in our spiritual walk with God. When you feel like your time of prayer or reading God’s word is sooo boring, tedious and lifeless. God’s voice seems so distant and your God vision becomes less clear, confused and foggy. I see it similar to driving a car on a rainy day and the windshield begins to fog up. Your vision starts to become less and less clear and the road ahead becomes less discernible. In that moment, what do you do? You look for that window defrost button, you push it and turn up the fan blower. You take action! In the same way, I feel when sluggishness of heart and soul starts to creep in and fog up, we have some options, where we can take action too! For the last week or so, I could sense my overall passion in God seemed a bit “off”. My prayer times were more from a place of duty rather than than joy. Even my excitement for the gospel was less ablaze than normal and I felt dull of heart and hearing. I could sense that the windshield of my soul was starting to fog up and that I needed to find that defrost button quick and push it! In fogginess of heart moments like this, I have found 2 powerful “Action Steps” that really can help me get my spirit charged back up in God and my heart vision more clear. # 1 PRAYING IN TOUNGES. Jude 1:20 says, “Building yourselves up in your most holy faith and praying in the Holy Spirit.” Kenneth Hagin says this word “building up” is a word that really means to “charge up” like a battery. I like that! I enjoy less active “Lamb type” of receiving prayer, resting in God’s love, meditative prayer. But our spirit also needs the “Lion type” of active, more aggressive Holy Spirit tongues. So yesterday, I decided to start a 3 day water fast and to pray in tongues as much as possible. I woke up early and forced myself to pray in tongues for 1 hour, as my mind drifted much. I actually tried to pray in tongues throughout the entire day, quietly under my breath. You should try this sometime, It is really quite powerful. Even as I lay in bed last night, I prayed myself to sleep in tongues. Today, only after 1 day, my spirit windshield has defrosted so much and my spirit is really charging back up. I can tell the sluggishness of heart has really diminished and God’s voice is more clear and my Jesus passion has more fire too! Sometimes our foggy and sometimes lazy soul needs a good Holy Spirit defrosting, with some “good ole” fashioned, fasting and Holy Spirit tongues! Hallelujah!! We pray Love Says Go and our blog would be a BIG blessing to your Jesus life! This Coke bottle God-story blew my mind! This over the top, God testimony is one of my ALL-TIME favorites for many reasons!! When Terry began as a first-semester student of LSGA, she was very new and unsure of what living a supernatural life of love might look like for her. Now, three years later, her Jesus-life shines brightly, and she encourages so many of us to believe God for even more. Terry now lives a radical life of love and risk in order to see others get touched by Jesus. God commonly gives Terry very specific details about people's lives: she routinely gets what she calls “God nudges” that reveal details like personal birthdays and sometimes names, too. Terry, in sharing her testimony, writes, “Oh my wow!! So, today I am with my dad at the hospital as he gets a follow up scan. While he was getting his scan done, I went to go find something to drink. When I looked in the first vending machine the bottles with ‘Jennifer’ and ‘Joseph’ stood out to me. So I took a picture with my phone. “That machine was not working, so I went to another floor and found another vending machine. 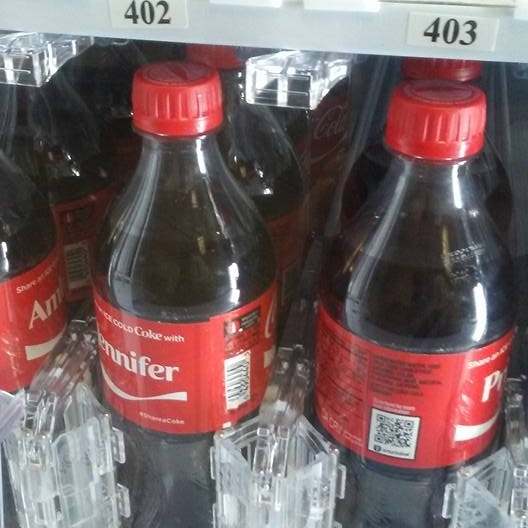 Another Coke bottle had the name ‘Jennifer’ on it and the bottle next to it had the name ‘Price’ on it. This definitely had my attention now. “So I get my drink, and head back to the waiting room. There I see a lady drinking a Coke, Hmm...Could it be? I stroll over and casually ask her, “Hi, I’m Terry, and you are ... ?” just being friendly and all. Lol. She says her name is Jennifer. Wait! What? I asked her if her last name is Price by chance? Jennifer says, “Why yes, Price is my last name” What! No flipping way! Haha! That is SO WILD! This blew my mind! “I showed Jennifer the pics I took of the Coke bottles with the names ‘Jennifer’ ‘Price’ and ‘Joseph’ on them and how God led me to her. I asked her if Joseph meant anything to her. Yes, haha, of course it did! “Jennifer said that Joseph is her husband, who has cancer and nothing seems to be working to treat that. Oh my heart! “I ask if I can pray for Joseph, and she agrees. We pray and commanded that cancer to go! I also told her that this was also God's way of showing her that He sees the details of their lives and is in this with them. They are not alone and are very much loved! She seemed pretty blown away by this whole experience... as was I!! We just finished and uploaded our latest How to Prophesy YouTube video. We uploaded our first How to Prophesy YouTube video around 5 years ago. YouTube analytics says our original version has had 421,5017 minutes watched in 186 nations. Wow, Praise Jesus! The first video we did was really poor quality, but it was the best we had to offer and God really blessed it! We are very thankful that we just uploaded a new and improved version that we now offer to you. We pray Jesus anoints this video to His glory! In this training session, we cover what basic prophecy is, and then we have fun practicing to prophesy! We pray this training video will help you get activated in prophecy! ❤️ Bless you, Jason Chin and Love Says Go team! Later, we went into the city, and Rouven and Claude saw a man with a boot cast. He was not open to receive prayer even though his wife keep telling him, "You should let them pray for you!" haha. Next, we went to the market, and then these Jesus miracles that you will see in the video above happened. Yay God! Next we saw a man who was walking really slowly. He had just been released from the hospital and had been battling a deadly disease. We first bought him some food; then, we asked if we could pray for his healing. He sat in the same chair that the ladies from farmers market sat in. The Filipino lady who owns this farmers stand was very happy to let us use her chair to pray for the man. We felt a afflicting spirit leave the man as we prayed. As our time came to an end, God told me that the short time we took to love this man with the love of Jesus may have saved his life. Even though we may not see all the immediate results we want to in the moment, we are to use our lives to bring life and freedom to others in Jesus name! We have the greatest privilege and honor to sow seeds of God's great kingdom, His love, and His power! I also had the privilege to met Salvatore at this great 'tasty' ice cream stand. Rouven and Claude met him a few weeks ago and prayed for his back. Salvatore was raised Catholic. My friends explained how to personally receive Jesus as his Lord and Savior, and he prayed the prayer of salvation. Salvatore also told us that since they had prayed for him, he had not experience any more pain in his back his back. His back was completely healed by Jesus! Praise God! JESUS IS KING! Let's shine bright with Jesus! Get our Free Healing the Sick eBook! We are really excited to share this with you! We just finished and uploaded our newest training session on Holy Spirit Word of Knowledge. This is a supernatural training video where we teach and then have a fun activation! We uploaded our first Word of knowledge YouTube video around 5 years ago. It was filmed in my bedroom with a free camera and a white bed-sheet tacked to the wall. I felt God asked me to make that video, so we did. Since then people in 196 nations have watched it! It is amazing how Jesus will bless whatever we do that is offered to Him! Praise Jesus! We are very thankful that we just uploaded a new and improved training video that we now offer to you. 😃 We pray Jesus anoints this video to His glory! Words of knowledge are supernatural factual details. They may be used to discern a healing need or an illness or pain in someone's body. They can be personal details like someone's name, birthday, age, occupation, or other factual details about his or her life. In this training session, we cover what a word of knowledge is, some biblical examples of it, and then we have fun practicing to receive them! We pray this training video will help you get activated in hearing God's voice even more clearly! Get our Free Word of Knowledge' eBook! We got to open air share Jesus to hundreds at a bike market just now! A girl gets saved! This was my best attempt to share Jesus in German at the bicycle fair minutes before it opened 😳haha!! Jesus liebt dich! (Boy I messed up the German) oh well I did my best 😜 I'm glad God is great at his job so we don't have to be perfect in our delivery. After I turned the camera off I was able to share some of my personal salvation testimony for another minute before they opened the doors. I went to this bike fair with my wonderful "mother in love" and after we found a great bike we saw a girl outside with crutches by the food. The girls name is Deborah (18 years old) was recently in the hospital. She had a foot infection pain that will not seem to heal. Her pain was at a level 7 out of 10. We prayed for her healing 4 times and then pain went down to a 3 or 4 and she said she felt tingling in her foot "like something was happening in there". She was surprised. We asked if she would like to also receive the free gift of salvation. She said "yes, I would like that" She received Jesus and she felt "peace". We talked more about what following Jesus means and gave her our contact info so we can share more about being a follower of Jesus! A lot of times we may think if the pain doesn't leave 100% right then or goes down just a bit it maybe takes away from the witness of Jesus in that moment. I have found the testimony of Jesus and sharing the gospel "IS the power of God unto salvation!" And Love Never Ever Fails! We have seen so many people open their hearts to Jesus and get saved after many "incorrect" words of knowledge or whatever else we tried didn't seem to work but we just asked "can I share what Jesus did for me...?" Boy the Holy Spirit is the greatest evangelist if we can just choose to open our heart to share Jesus with others! I also expect miracles to happen right away cause that's the model and example that Jesus showed us and told us to follow. ❤️ we the body of Christ are growing in this! Praise God! We haven't arrived yet in experience to the standard but we're getting closer all the time! We also felt an impression over her life that she was good with children and she says that is what she is in her apprentice school for is "children"! Yay! Love you and let's give the world CHRIST in US. He is good at His job so we just get to keep "trying, practicing and growing WITH HIM!" Whuuhoo JESUS!! These 4 precious girls say "YES" to Jesus! Jesus instantly healed the girl with the glasses hand, it was wrapped up in a bandage and she could barely move it. God healed it...Praise Jesus!! We also shared Jesus and loved on these precious God-loved people too: a man who said he hates God and Christians, a Catholic priest, a kind muslin lady (only spoke French), the Starbucks girls we shared our testimonies with as we got our coffee...(yes Starbucks, I'm still American at heart), a new age believing lady who has tried many religions (we shared why 'only' Jesus) she felt "positive energy" from us but had to go, a kind Italian man looking through the trash getting bottles. He also asked Jesus to save him after hearing the gospel. What I saw last night was a sea of humanity, with so many beliefs and life's experiences. We shared the same gospel of love, power and salvation to them all and had so many varying responses. What I saw was the radical love of Father God that doesn't look at their heart condition or their 'yes' or 'no' to determine what He chooses towards them. It's the most precious and holy thing to be able share Jesus with the world. No matter what we see...someone told us to "F" off last night, or the 4 girls hearing the gospel for the first time and saying yes to Jesus, and eveything in-between. Our motive of love and our actions can stay the same...we preach the radical good news of Jesus...we can demonstrate Jesus' love and His power...we can ask to see "the world" through His eyes 😍and we can loudly declare HIS GREAT LOVE FOR THEM through JESUS!! And give a lot of hugs in between!! Fun side note: the angry man that told us to "f" off we said, "we can't wait to see you next time and tell you again of GOD'S love for you!" We saw him again as we walked home and again we said how much Jesus loves him and again he said some "choice words" for us. We replied, "we hope to see you tomorrow 'friend' looking forward to it!" Love doesn't look on the outside or at peoples response it see beyond that and sees priceless 'value' in every person that is created in the image of God! Yay Jesus!! Yesterday my friend Arnaud and I went across the border to Germany to hang out and go shopping. In the mall the lady pictured had Jesus heal her knees. She was so shocked! She only spoke French so there was a a pretty big language gap but she said she had Jesus living in her heart. At one point she grabbed my hand and put it on her head for a blessing. Arnaud prayed for her daughter too. We asked Holy Spirit for some details for the young man in the kiosk. We were asking God for his name. The first two we asked were wrong then he said it starts with an "A" then we asked if it was Andrey it was. We started telling him about Jesus and he said he doesn't believe in Jesus anymore. He grew up in an orthodox church but has long changed his beliefs. Arnaud asked if he needed healing in his chest. He said his throat and stomach needed healing. When Arnaud prayed the young man he was so surprised because he said "it feels warm!" We got to share about what a real thriving relationship with God looks like for us apart from just religious tradition. We talked to him for a long time and invited him to come back to Jesus. He thanked us and said he will think on what we shared. We asked if they had any "schmerzen" (pain) in their bodies. The girl in the pink says her back was pain 3-4. They had to get off the bus right then so we decided to get off the bus too. Even though that was not our stop. We prayed for her and Jesus made the pain a "0" she said "what the F###!" She couldn't believe it. She said, "It is really warm too!" We explained how that is the Spirit of Jesus that she is feeling and shared the gospel of salvation and asked if they wanted that . All three said yes they did! We got back on the bus and it was sooo packed that we barely fit. We felt to open air preach GOD'S radical love and we prayed for hope for all of them. When we got off, a father with his young daughter sitting on his shoulders came up to us and said "hallelujah thank you for what you shared on the bus!" Thank you Jesus for your great love, power and plan for all of Europe to be saved and adopted into your Great BIG family!! Come on Jesus!! ❤️This just happened! Jesus the Healer and Savior! We went to a little coffee shop after church and the lovely lady on the right with darker hair was our waitress. I heard Holy Spirit whisper to my heart "she has back pain and the other blonde lady (the manager) has a knee/leg problem. So with my friend Rouven we asked and they both said "yes" that was true and they were very surprised asking "how do you know?". We shared Jesus with them and asked when they were caught up serving the other tables we would be so honored to pray for them to be healed. 5 minutes later our waitress came over and took us to a private place to pray for her. Rouven and I went with my wife's mom to pray with her. She has had back pain constantly for 2 years and has been seeing a doctor because of it. After 1 prayer 30% better, 2 prayers 70% better, 3 prayer she felt Holy Spirit heat and something like wind swirling around inside her. She smiled so bright and she was 90% Better! We said she would be 100% better in just a minute. We asked if she has received Jesus as her savior. She said she was a follower of Jesus and has received Him as savior already. We all hugged and my mom in law got her number so she can invite her to an upcoming ladies meeting. Before we got back to our table she says she was "perfect" 100% healed! Her face was radiant with GOD'S presence and she excitedly told her manager that she was healed!! The manager looked to us with a look saying "I'm next!"!! Haha come on Jesus! A few minutes later the manager grabbed us and took us to the same place to pray for the pain she gets in her legs from a vein problem. We prayed and she also felt heat and GOD'S presence. She wasn't in pain at that moment. We got a word of knowledge about a "fear of finances about her job". She was shocked! She couldn't believe it because in 3 months this restaurant is shutting down and she has worked there for 10 years. She has been so worried of what she would be doing next. We prayed for her again and the Holy Spirit was really touching her. She was leaning against the wall because of GOD'S presence. She also said she could feel GOD'S presence so strong! Yay Holy Spirit!! My father in law asked her about receiving Jesus as her Savior and she said she has never done that and would really like to! So this beautiful lady accepted Jesus as Savior and asked Him to make her brand new in Christ!! Come on Jesus!! Both these two ladies were loved by Jesus the healer today and both these ladies will know Jesus as their Savior for ALL of Eternity!! Praise Jesus!! Tomorrow we plan to have coffee there again and bring the wonderful manager a bible :) cause she said she wants to start reading it!! We hope to continue to meet up and help them become followers of Jesus!! Yay God!!! P.s. Latte macchiato's always taste better in GOD'S presence!! Whoohuuu Jesus! !